That's how I feel ever since this lovely little package arrived today! 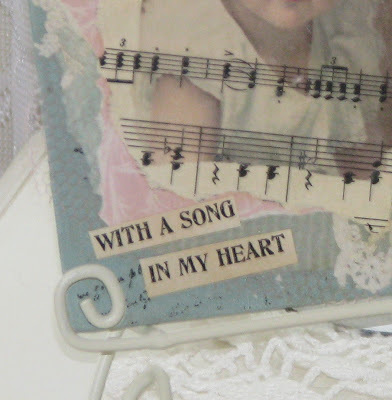 I have a song in my heart...and I'm so happy for the privilege of meeting so many beautiful women in blogland. ...this beautiful piece of artwork created by the amazingly talented Lynn @ Her Creative Spirit. Lynn, I can't even tell you how much I love and appreciate this beautiful gift. It is truly a treasure to have one of your creations in my home. Every time I pass it, or see it across the room, I will be reminded that wonderful new friendships are possible even across the miles. Thanks again! The door looks so pretty. My!! you come up with such cute stuff!!! And the gift you received is truely a workof art. How pretty! !